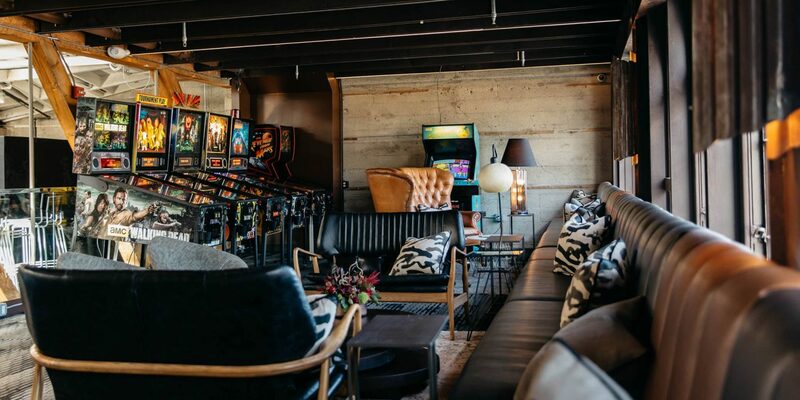 This 10,000 square foot, two-story space in SoMa is the perfect after-work spot to hit with coworkers; it’s also a great date spot for those looking to expose their playful side. Happy hour runs from 4-7 p.m., Monday-Friday, and features $8 cocktails, $6 well drinks, and $2 off all draft beer and wines. As for the games, they have a little bit of something for everyone. Free-throw basketball, pinball, and plenty of retro multi-player games. To play, you exchange your dollar bills for real quarters in a machine (instead of those fake gold coins), which is great because whatever you have left over can be used for your next load of laundry. For those strapped for cash, they offer free play on all games the last Sunday of every month! This space gets VERY crowded on weekend nights, so if you aren’t the patient type (or if you are the claustrophobic type), come for their weekday happy hour (4-7 p.m.) featuring $1 off all drinks. Their craft beer list is extensive and impressive, and their wine slushies are dangerously good. They host Killer Queen league nights on Wednesdays (one of the more popular games at the bar) and special events like Mario Kart tournaments. We’ll look past the fact that this ping-pong bar spells its name like we did everything on our Myspace page back in ‘08…because it’s a freaking ping-pong bar! The price for an hour of play ranges anywhere from $30-$80, depending on whether you go during peak or non-peak hours. But there’s a ton of space and it’s still relatively new (so it’s not dingy yet), making it a great place to hit up with your coworkers or for a friend’s birthday. In addition to Wednesday night trivia with “Quiz Master Keith” (7 p.m.), you’ll also find a pool table, pinball, an extensive selection of board games, and a photo booth. For drink specials, enjoy all night happy hour and 20 percent off big bottles on Sundays, and late night happy hour (10 p.m.-close) on Wednesdays. They also make a couple of sinfully good burgers here and you can—get this—substitute a normal bun for two grilled cheese sandwiches… WHAT A TIME TO BE ALIVE. This 14-hole indoor mini golf course probably sees more first dates and first kisses than any other mini golf course in the country. They serve surprisingly delicious comfort food and have two fully-stocked bars for those of us who are sore losers. If you’re looking for a way to level the playing field, play the “pink putt challenge” where you finish the whole course with a super tiny pink putter. To be honest, we come here for the food. The bowling (and cocktails) are just an added bonus. You’ll want to make reservations for a lane as there are only a few; however, they do reserve one lane for walk-ins. While normally a 21+ venue, they have family hours on Saturdays & Sundays from 11 a.m.-7 p.m.. OH, and they do brunch. Probably should have led with that. At this Polk Street-ish bar, it’s all about spinning the wheel. For $11 bucks (tip not included), you can try your hand at spinning the booze wheel where you can win everything from a Mule Kick in a boot or cement mixer shot to the coveted bottle of champagne. Prefer not to leave your drink choice up to fate? This bar also features old-school Mario Kart in the back, Tuesday night trivia (8 p.m.) and a jukebox. 2 for 1 on all beer, wine, and liquor during regular happy hour Monday-Friday, 5-7 p.m. and 2 for 1 liquor during late-night happy hour Sunday & Monday, 10 p.m.-close. Located in the lounge of Hotel Zetta, the S&R Lounge food and drink program is from the same folks behind SF favorites, Marlowe and Park Tavern. The main floor of the lobby is home to a chic bar and a giant wall-sized Plinko game. Upstairs from the lounge is The Playroom which boasts a pool table, board games, photo booth, and more. They unfortunately close early for SF standards (at 11 p.m.), so you’ll want to start your night rather than end it here. While normally we avoid Union Square like the plague, we’ll make an exception for this multi-level bar. They’ve got HELLA beer on tap (over 100 beers available at any given time) and plenty of TVs for catching the Warriors or Giants. As far as games go, they’ve got all the bases covered here, too: regulation shuffleboard tables, SkeeBall games, foosball tables, new and vintage arcade games, and pool tables. This uber-cozy (hence the name) sports bar feels comfortably out of place on Polk Street. They host a board game night on Wednesdays (7 p.m.-2 a.m.)—yes, they have Catan. And good news for the germaphobes of SF, this bar scored a perfect 100 on their recent city health inspection. We’ll definitely drink to that. You’ll find classics like pool, shuffleboard, darts, basketball, and more in the back half of this dive-y bar. Just be warned that this spot is notorious for calling last call long before its listed 2 a.m. closing time. Kiera is a Bay Area native, reluctant member of too many group texts, and can typically be found with a taco and beer in hand (in the corner petting a dog).